Powerful story about the dramatic impact WWII had in the home-front as Japanese American families were uprooted from their every day lives and placed into internment camps in Western US in the early 1940's. Faced with a country that now doubted their loyalty and struggling with their new situation, they turn to baseball as a way to handle their plight and find the strength to stand up for themselves becoming a true symbol of honor and pride. Director: Desmond Nakano. Actors: Gary Cole, Judy Ongg, Masatoshi Nakamura, Aaron Yoo, Leonard Nam. AMERICAN PASTIME takes a Japanese perspective on the events of World War II, making it a cinematic cousin of Clint Eastwood's LETTERS FROM IWO JIMA. 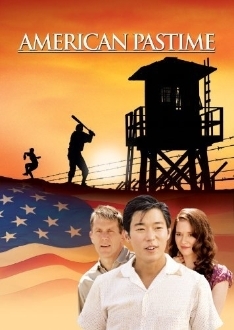 Most of the events take place after the war has finished, and revolve around a group of Japanese-Americans who faced prejudice and scorn in the U.S. Fortunately, their love of baseball goes a long way to repairing Japanese and American relations.